You must have known that I am having some tea now :-)) Shortbread cookies are always a favourite. And they are so easy to make, Angie, no muss, no fuss! Just a bowl and spoon. Finally, a painless way to consume tea! Alas, I lack the gene…or is it Jean? My favorite tee has a golf ball on the end of it. Yes, Sully, "painless!" Even you can now consume tea! :D While *tea* is a way of life for me, *tee* ... well, not so much. My golf skills (or, rather, lack thereof) are legendary. I have never heard of this before so I am so excited and going to save & pin this to make as well. I am in love with your blog Jean!! Suzie, thank you soooo much! You just made my day! 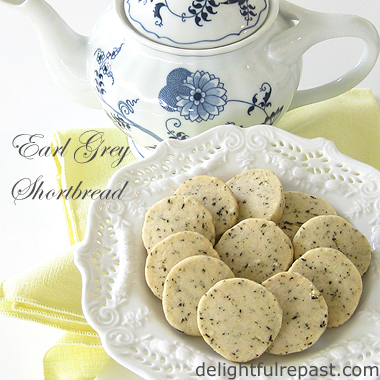 I've been thinking about making shortbread lately and I love Earl Grey tea. This is perfect! Thank you, Sandra. I hope you'll try it soon and let me know how you like it! Edye, thank you! Have a great weekend! Tea and shortbread make a wonderful pair. I love Earl Grey tea most of the time or a peppermint/lemon balm tisane with leaves from my own garden. Earl Grey is one of my favourite blends too! I especially like the creamy versions. 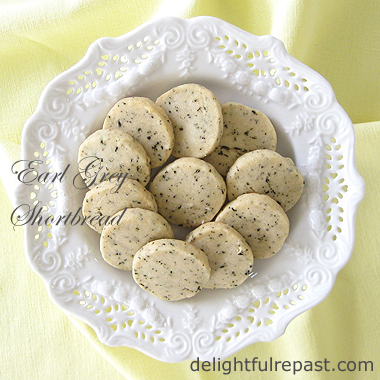 This Earl Grey shortbread cookie is right up my alley. Lorrie, I'd love to have lemon balm and peppermint in my garden! The mint scares me a little, though, because I've heard it can completely take over. Margie, I hope you'll make it with your favorite Earl Grey. I haven't tried any of the creamy EGs yet. First of all, one can't go wrong with butter, sugar, and flour. But adding the tea is genius! I can wait to make this. And the photo is beautiful, BTW. Thanks, Judy! I can't take credit for adding the tea; many others have done that, not sure who did it first. These are really different. They look delicious. Marilyn, thank you so much for sharing my links! You're the hostess with the mostest! Krista, thank you! Kids like these little tiny cookies too. Now these look easy and fun to make for a summer tea party! I saw this @ Full Plate Thursday and it brought me back to Mother's Day Tea @ the Brown Palace in Colorado. 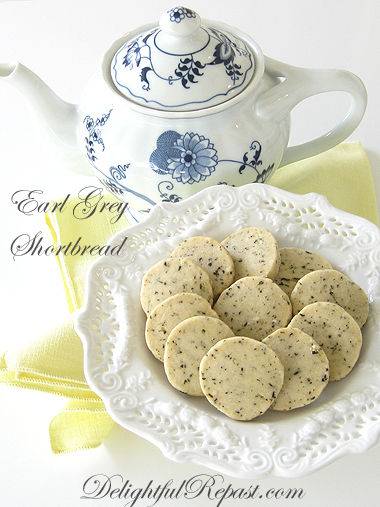 Love shortbread and earl grey tea. Perfect combo! Thanks! Perfect with tea or cocoa! Beautiful! CCC, they really are. I don't even bother with the mixer, they come together so easily by hand -- and with ingredients I always have on hand. Wish I could share a shortbread cookie and a cuppa tea with you, Jean. I'd like a cup of black tea, please, with milk and sweetener. We could discuss all of our favorite kitchen toys and you could tell me why I need an immersion blender. Also, I forget which brand of Earl Grey is your favorite. I love just Irish Breakfast tea. Michelle, thank you. I do so love a posh hotel tea! Karen, thank you. I don't drink many herbal tisanes, but I wouldn't like those flavors either. Thanks, David! I haven't had a cup of cocoa in a very long time -- good combo. Kitty, that would be grand! I didn't have an immersion blender until recent years, but now I see what all the fuss was about! What a beautiful, dainty cookie. I love tea. I have made cakes with tea in them but not cookies. Saving your recipe to try. Thanks, Pamela! Do try them soon and let me know what you think! These look wonderful! I will have to get some Earl Grey tea or some more flavorful tea, at least and give them a try soon! Thanks, Jean, for the great recipe. Thanks, Lily! Twinings Earl Grey is my favorite of the readily available, easy to find Earl Greys. I have a folder of things made with Earl Grey tea - this one is being added. Thanks so much for sharing, link and participating in my blog party! Thanks, Bernideen, I am honored! Love your blog party! Thanks so much for sharing this at "Tea In The Garden". How elegant! Thank you, sweet Jean! Thanks, Karen! They do go so beautifully with a nice cuppa tea! Great idea, Greg! I'm almost to the bottom of one tin, so I'll have to see how much "dust" is there. 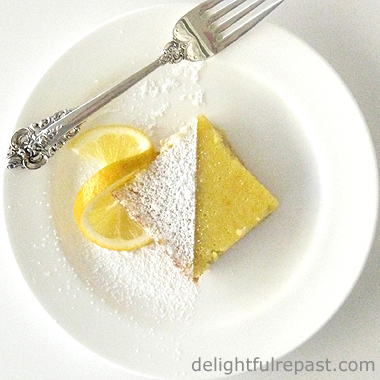 Thanks so much for sharing this awesome Shortbread with us at Full Plate Thursday this week. Hope you are having a great weekend and come back to see us real soon! Tea and biscuits together sounds like a great idea! Thanks, Amy! Yes, with tea in my biscuit as well as in my cup, I'm perfectly happy! What lovely shortbread, Jean! My husband and son adore Earl Grey tea and I know they will love these! I'm very partial to Royal Blend Tea, a special blend from the London grocer Fortnum and Mason but it's very hard to pick an absolute favourite tea. Thank you for sharing this lovely recipe with us at the Hearth and Soul Hop. April, thank you. Fortnum and Mason's Royal Blend *is* a wonderful tea! I like it with just a teaspoonful of milk. Can you call me for tea with this cookies, I am in love with it, thanks for sharing, pinning and tweeting. Ohh, Swathi, that would be wonderful! Thank you so much! I love Early Grey and I love shortbread! I can't wait to make these! Elsie, thank you! I hope you like them as much as we do! Wow your cookies look and sound so good! I think they are almost too pretty to eat...Almost! thanks for posting at country fair blog party! Clairejustine, thank you. How could anyone *not* love cookies? !